Welcome! - B.A.C.I. Enterprises, Inc.
B.A.C.I. Enterprises is a company founded and directed by Beth And Carmine Iacullo. 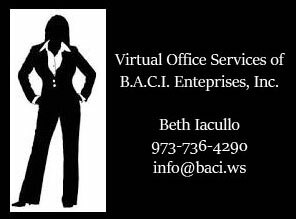 As a New Jersey based corporation currently working with both large and small companies as well as individuals in various types of businesses and situations, B.A.C.I. has been proudly providing professional services since 2001. Striving to exceed client expectations, we focus on providing clients with the expertise and experience to help you reach new heights, both personally and professionally. The staff at B.A.C.I. prides themselves on making each and every client their #1 priority by delivering state of the art services in the most cost effective manner. A busy person is a busy person, no matter who you are or what you do. If you’re an overwhelmed Corporate Executive or Small Business Owner, we can help give you more time to focus on what matters most. If you are an overwhelmed parent or individual with one-too-many to-do’s on your list, we are here for you. 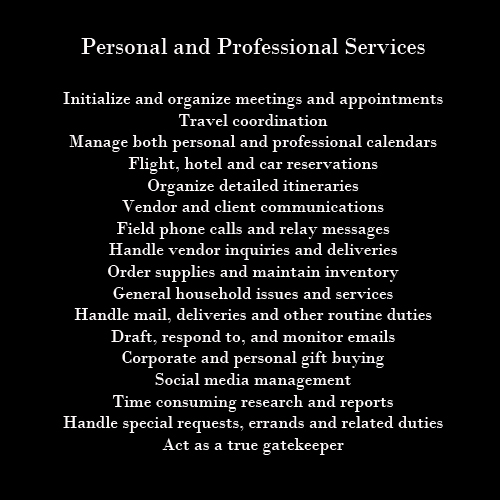 Our services benefit anyone who is busy or overwhelmed, regardless if you need daily assistance or once-in-awhile type of help. Whatever you need, we will gladly help! Our mission is to deliver exceptional results and exceed your expectations.